This month for the Imagine Circle at do. Good Stitches we were asked to create four improv-stripped flying geese in warm yellows, browns, and creams with a solid red triangle using this tutorial. 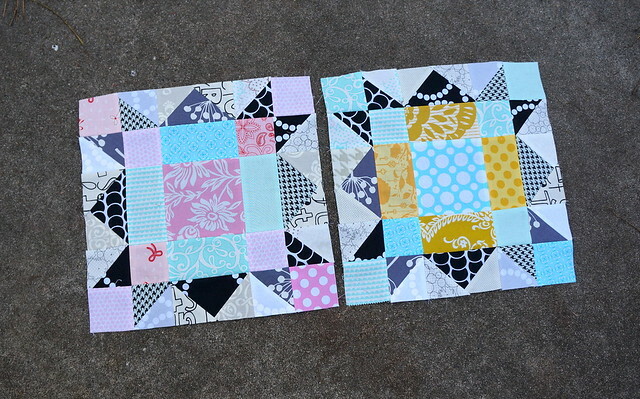 These were really easy and fun to make - this is going to be a gorgeous quilt! By the way, isn't that hexagon print to die for? I think I got it in a scrap pack at some point, and I don't know what it is, but I want more! This month, our do. Good Stitches group is stitching up some gigantic square-in-square blocks. This came out to 21" unfinished. I really love the colors this month; I can't wait to see how this one turns out. Boy is it hard getting any sewing done this time of year! With all of the different events, shopping, and card-writing, I haven't had any time to sew in a while. I got these pretty bee blocks done last week for December for my do. Good Stitches circle, though. 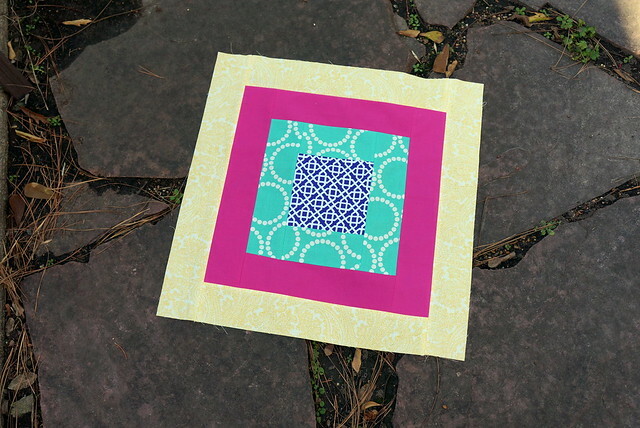 These Weathervane blocks were very easy to put together, and I love the colors our quilter Rachel picked out. I'm glad she loves scrappy blocks - I get to use more out of by scrap bins when that happens! For November's do. Good Stitches block for the Imagine Circle, we got to stitch up this cute Starstrip Block in one color, and I picked teal. I was surprised at how quickly this block came together, and of course I love the color! The October block for my do. Good Stitches bee is a Pineapple Blossom block in golden yellows, pinks, peach, and tangerines. 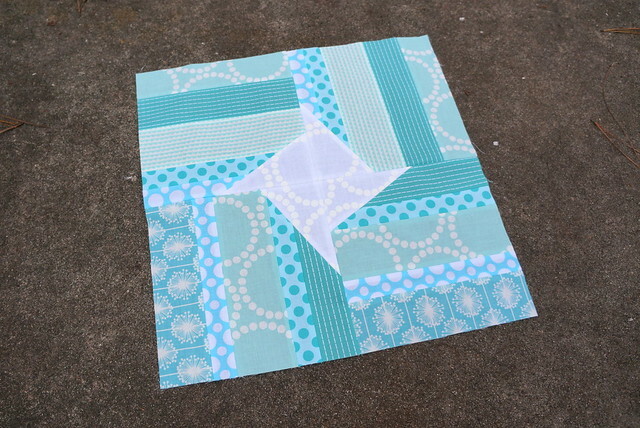 We used this quick and easy tutorial, and this was a really fun block to put together. I really love the colors, and it couldn't have been easier to sew! Our September block for my do. Good Stitches circle is a new block to me, called Boy's Nonsense. 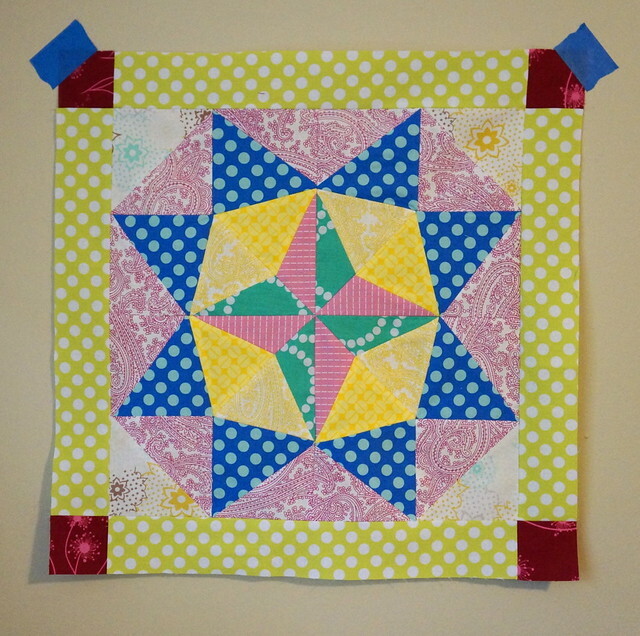 Amanda wrote a tutorial for putting together 12.5" blocks, and they're very quick and easy to stitch up. 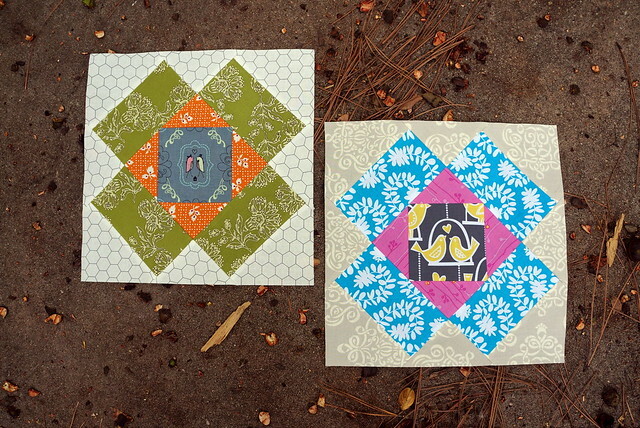 I enjoyed picking out prints to fussy cut, and I ended up with two different lovebird prints. It's going to be fun to see what everyone does with this month. I managed to squeeze in both July and August's do. Good Stitches bee blocks for the Imagine circle right at the end of July. 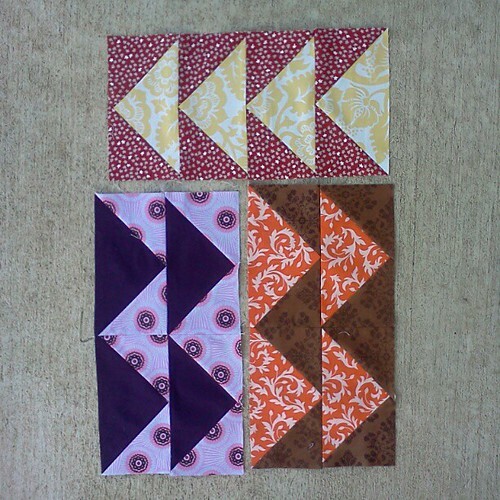 These New England blocks were fun to make, and really good for using up small scraps. I didn't have to touch my main stash for these, which is always exciting, considering how large my scrap bins are. 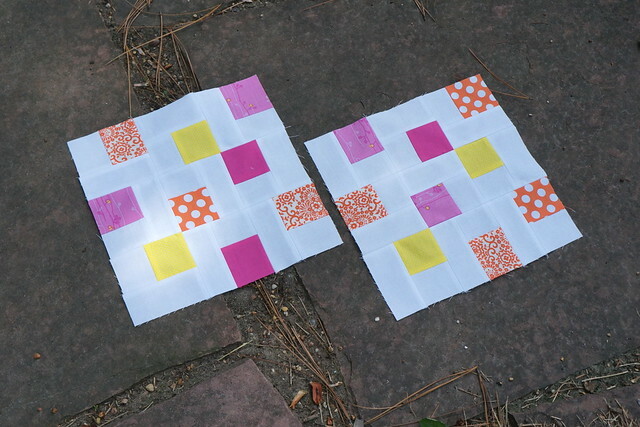 These fun square blocks were much easier to make than they look. And who doesn't love these fun colors?? In the midst of moving, I haven't had a lot of time for sewing, but I'm finally starting to get back into the swing of things. I managed to get my sewing stuff unpacked just in time to sew up my do. Good Stitches block for July and get it in the mail without being late. 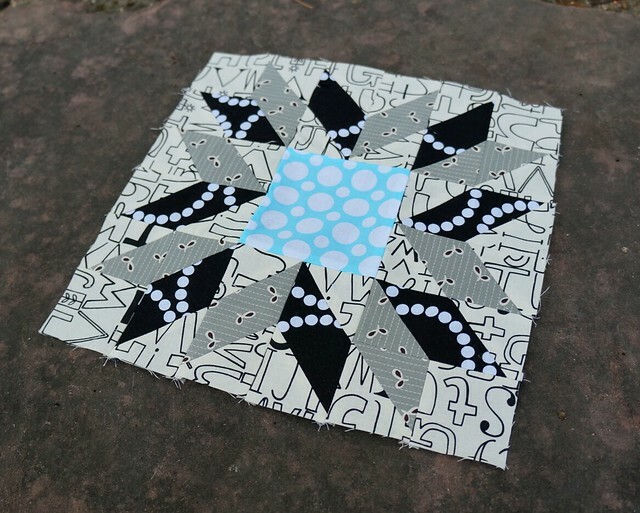 This month's assignment was a fun star in black, grey, white, and a teal center. It was surprisingly easy to put together - I expected much more work than was actually required, which was a nice surprise. I've started making some progress on my Marcelle Medallion quilt as well. 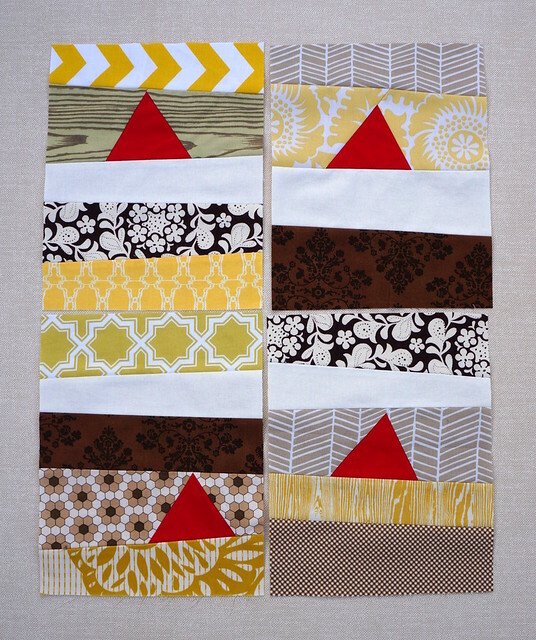 I added the first border, and I've started cutting out a million equilateral triangles for the next border. The cutting is a bit time-consuming as (a) it uses a template, and (b) I'm making it scrappy, so I have to cut out a few from every single print I've pulled out for this quilt. Thank goodness for Hulu for keeping me entertained while I cut! I got my bee blocks done nice and early this time. For January in my circle in do. Good Stitches, we were asked to make two Whirled blocks in blacks, greys, and white. 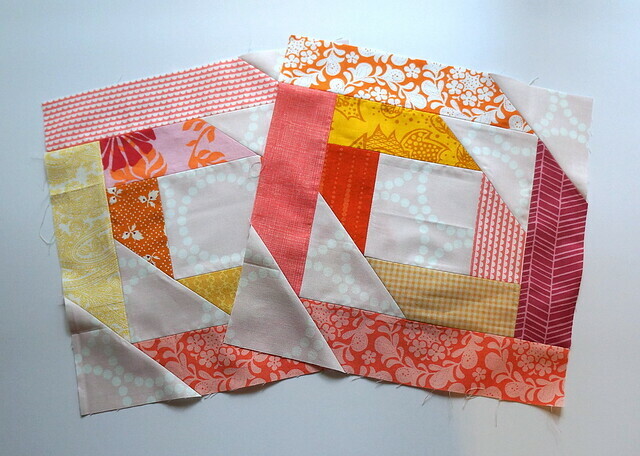 These were extremely fast to put together, and I think they're going to make a great quilt! For February, we were asked to make two Bracket blocks, inspired by the Pantone color of the year, Emerald. 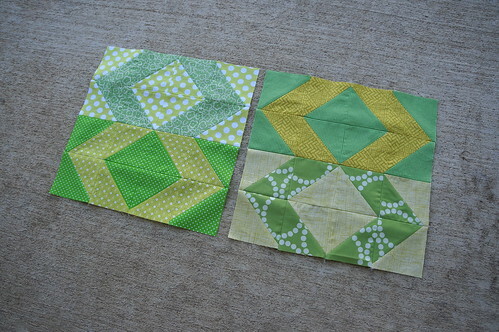 All shades of green were ok to use, so I pulled from my stash some pure greens and some yellow-greens to make these fun blocks. It's amazing how yellow the yellow-greens look next to the more pure greens. 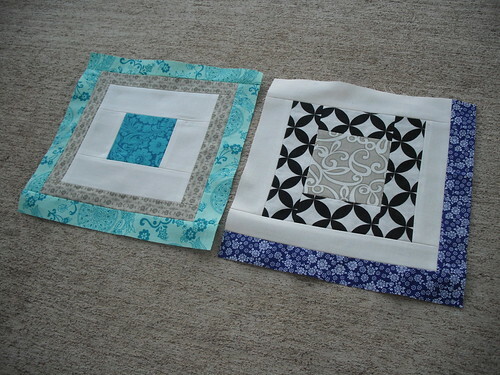 This is another easy block to put together, and I think the resulting quilt is going to be stunning. Sorry for the break there everyone. I got a little busy while I was finishing up my PhD. The good news is I defended two weeks ago, and I passed! I've got all of my paperwork turned in, so I'll be graduating this semester. Woohoo! I've barely had any time to sew over the last few months, but I did manage to keep up with my bee blocks. October do. 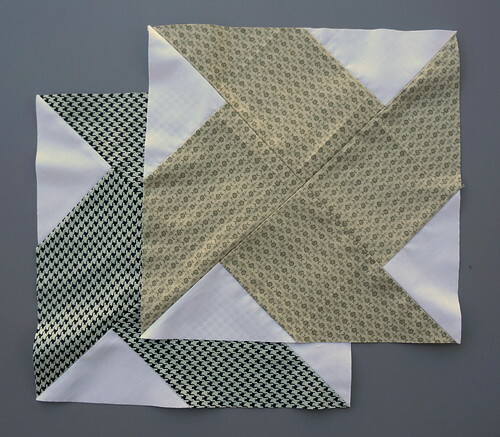 Good Stitches flying geese blocks., a photo by jenniferworthen on Flickr. 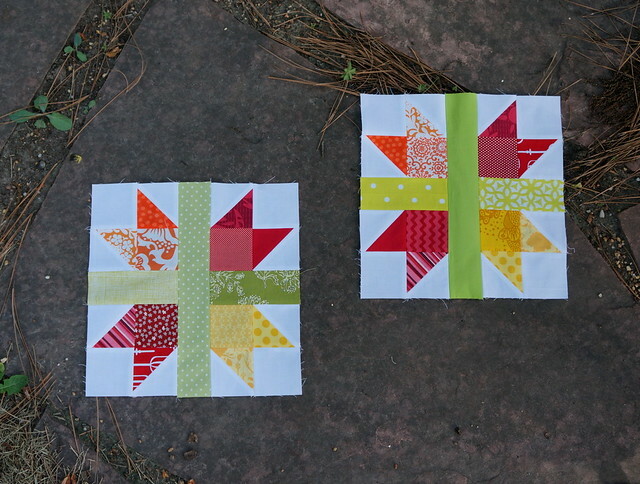 For October we were asked to make flying geese blocks with fall colors. I've always wanted to make flying geese, so these were really fun to make. November do. 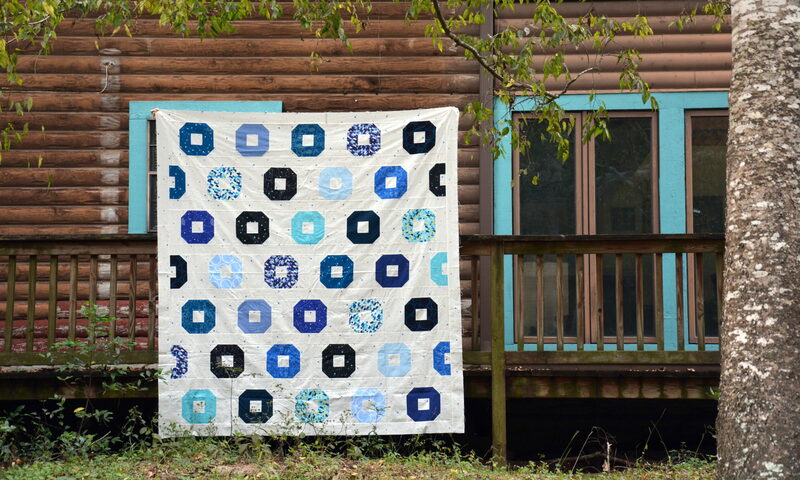 Good Stitches square in square blocks, a photo by jenniferworthen on Flickr. For November we were asked to make square-in-square blocks in black, white, blues and greys. I'm really happy with how these turned out, and I think the final quilt is going to look awesome!